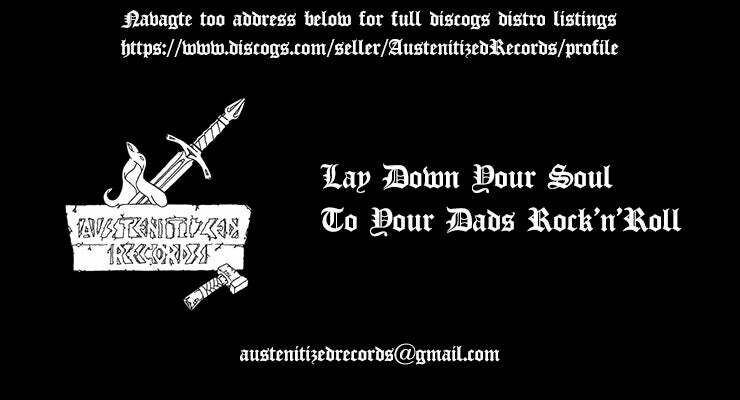 Austenitized Records Logo beer Koozie with our new campaign slogan on the b side. Have you ever watched a classic band and seen some short hairs roll their eyes and mutter dad rock under their breath? At Austenitized Records it is our belief that if you can't appreciate rock and roll you couldn't possibly be reckless or wild enough to fully appreciate heavy metal. I don't care how extreme you think your taste in music is. Your judgment can't be trusted. So join us and Lay Down Your Soul To Your Dads Rock'n'Roll ! You can purchase one for as little as 3 dollars buy a new Isenblast or Sauron LP and have a free one tossed in your order !